We decided to travel to Patagonia this year to complete some unfinished business. 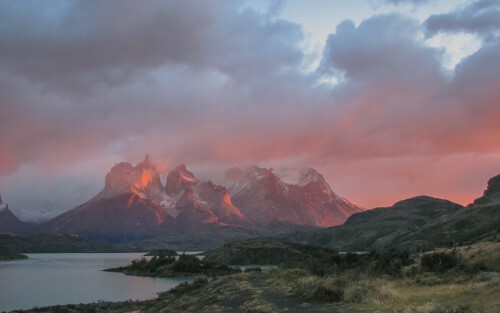 We came to Patagonia as part of a longer trip in 2008, spending three full days in Torres del Paine in Southern Chile. We got in just before midnight one night after a full day of traveling, went on all day hikes the next two days in cloudy gray skies, and then on the third day walked straight uphill in a blizzard to a "lookout" where we couldn't see anything and the wind was blowing 80+ mph, and then spent that afternoon thawing and drying out. So, why might you ask, would be interested in coming back to this place, of all the great and fascinating places we've visited? Mainly because in the limited glimpses of half-decent weather, the scenery was unlike anything we'd seen anywhere, and in fact was legitimately awe-inspring. We couldn't get the pinkish-orangish sunrises out of our mind, as in fact we see them every day in our house on a large print we made of one of the photos below. So over the years we wondered to ourselves - if it was that awesome in bad weather, how good must it be if the weather is even halfway decent? 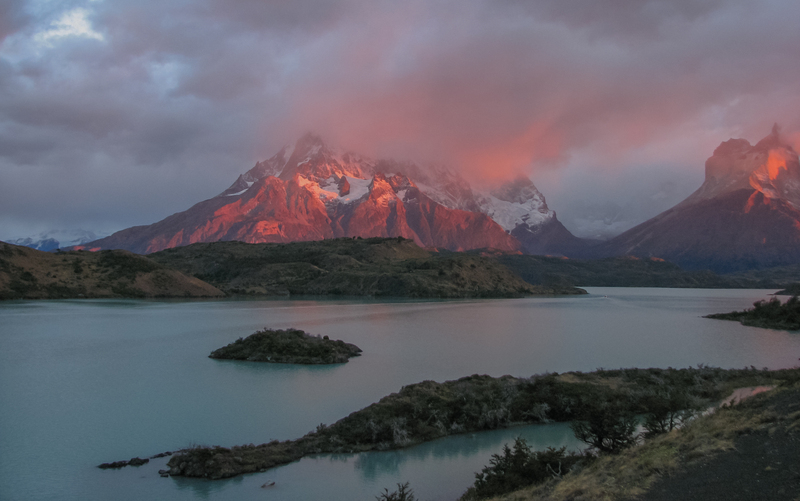 And since our last several trips had been to warmer, tropical climates (e.g., Palau, Polynesia), we pulled the trigger on heading back to Torres del Paine. We decided to combine that with a nearby park in Argentina that our friend Nick raved about, El Chalten. The same company, Explora, offered a combined excursion including 6 days in Torres del Paine and 4 in El Chalten, so it was easy to book. We decided to add on a couple days in Buenos Aires on the front end, and one night in Buenos Aires (New Year's Eve) on the back end, and that was that. We hadn't traveled over the holidays since going to Antarctica 8 years ago, but we thought it might be nice to be away from the TV commercials, traffic, and everything else that tends to eat away at what should just be a joyous time of year. Speaking of traffic, we thought it was going to horrible driving up to LAX. It was a Friday afternoon, which always has bad traffic. It was also raining in Southern California, which is basically the apocolypse when it comes to the freeways. And it was December, which usually has more people heading out for long weekends. But, for whatever reason - and we genuinely don't care what that reason is - it was really not bad today. We ended up at LAX well ahead of schedule. The check-in line at LATAM (LAN and TAM merged a few years ago, shortly after our last South America trip in 2010) was very short, about 1% as long as the line for Philippine Airlines. Security wasn't too bad either, and we were at the gate several hours before scheduled take-off. Despite being much better than it used to be, the amount of food and shopping choices inside the Tom Bradley terminal doesn't hold a candle to most airports, particularly busy international airports. After being underwhelmed by everything, Justin got a combo from KFC and Crystal got a sandwich from the Ink Shack. Then we got some decent (at best) wine from Vino Volo, and waited for boarding time. They told us there was a slight delay, and to come back in 40 minutes, so then we got one more glass at Vino Volo, and came back 35 minutes later. When we got back, they were already boarding, so thankfully there was plenty of overhead space. Both of us went straight to sleep, but the flight attendants woke Crystal up to see what she wanted for dinner (the answer, as always - sleep), and she graciously told the flight attendant to leave Justin be. We spent most of the flight asleep.